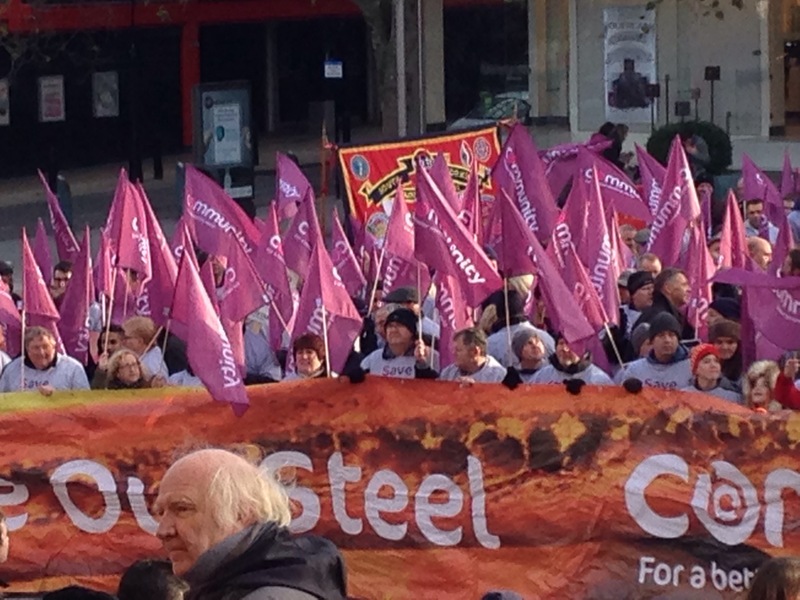 On Saturday, Unite joined with our fellow steel unions, the GMB and Community, to hold a rally in Sheffield. 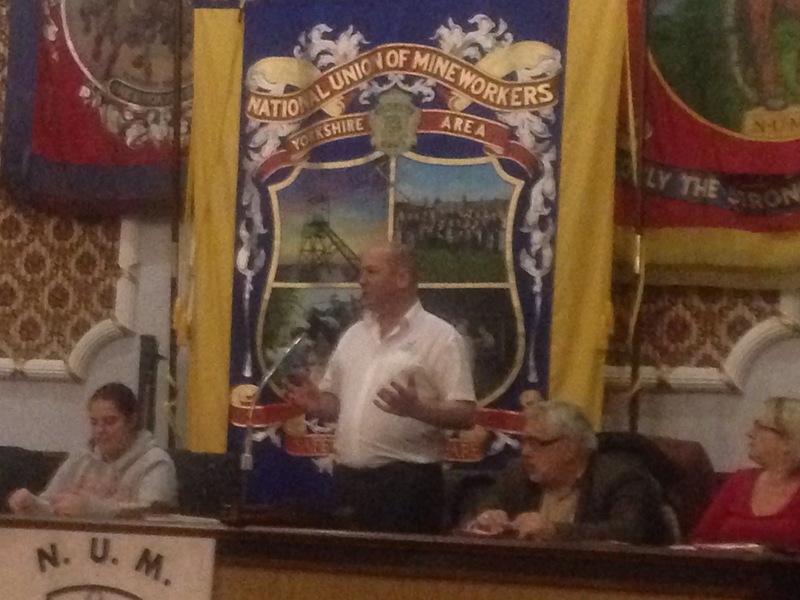 The event brought together hundreds of members and their families, travelling from Wales, Scotland and across England. 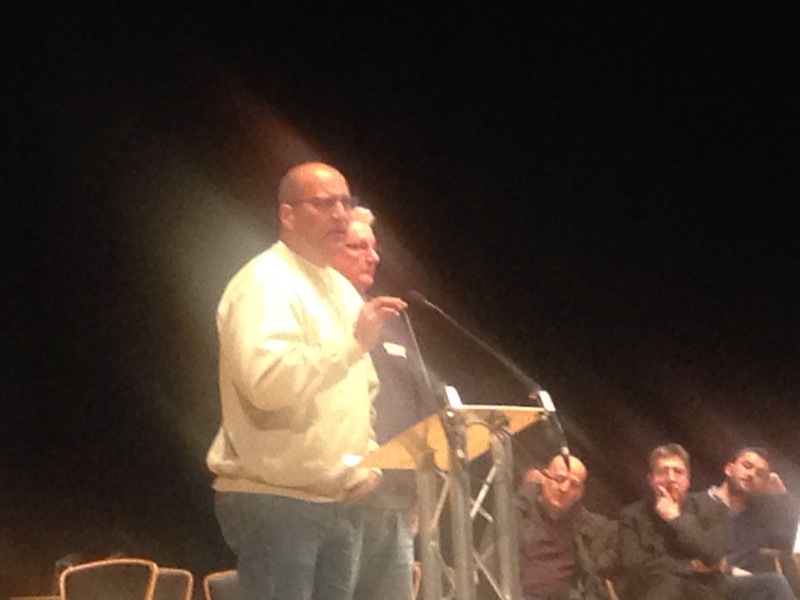 A film of the full event is in production and will follow shortly, but for now here is the GS’s speech to the workers and their families. The campaign goes on – please do lend your support to our members and this vital industry by sharing these links. 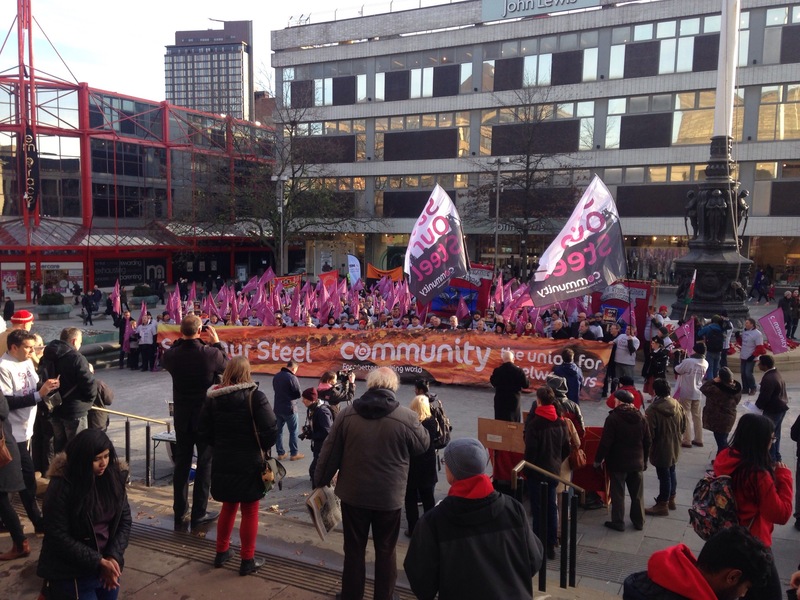 There was anger at the Conservative government at the Save Our Steel rally in Sheffield, for allowing the collapse of our steel industry. SOS speakers were Kevin Maguire of the Daily Mirror, Julie Dore leader of Sheffield Council, Charlotte Upton of Unite Tata Steel, Roy Rickhuss the General Secretary of steelworkers’ union, Len Mckluskey the Unite General Secretary, Alan Coombs of Community Port Talbot, Frances O’Grady of the TUC, Andy McDonald Labour MP for Middlesbourough, Tim Roach and many more! 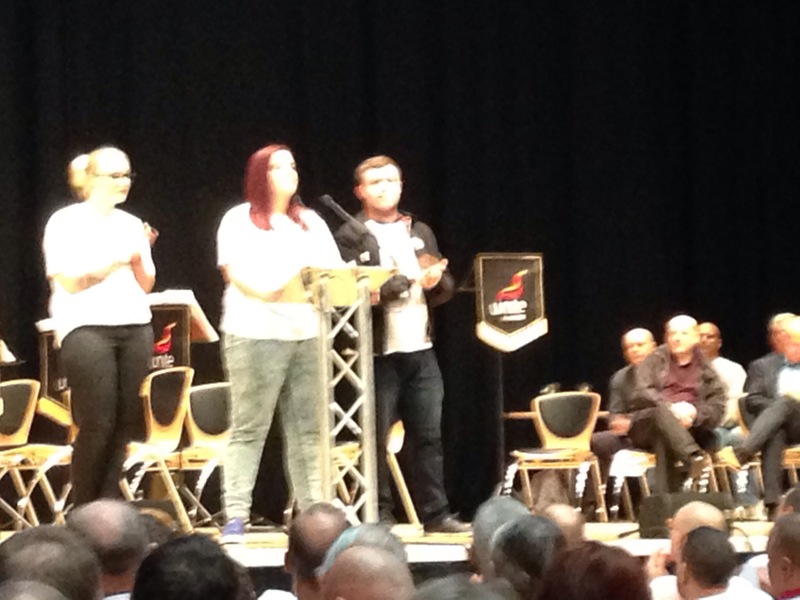 Fantastic speeches were made by the United Steel Workers (from America) who have been locked out for 100 Days and Charlotte Upton of Unite Young Member and TATA Steel Rep. The nature of the South Yorkshire Casuals has been emphasised by the letter in this week’s Chronicle supporting them sent by Daniel Cooke. Daniel Cooke is a long standing member of the BNP who posed with a replica gun at a BNP St George’s Day party in Rotherham in 2011. In the same year the Chronicle reported that he had been found guilty of criminal damage; he had given an address in Skelmanthorpe but denied knowing the woman who lived there who said she was his girlfriend. Cooke has always been an unpleasant fantasist so he fits in well with the South Yorkshire Casuals. The antagonism to the Casuals’ demonstration continues to grow so the meeting we are having in the library on Saturday 5th December at 11am will be important for getting together people who want to make the counter demonstration as large as possible. A leaflet for both events is attached. Please spread the information as widely as possible. 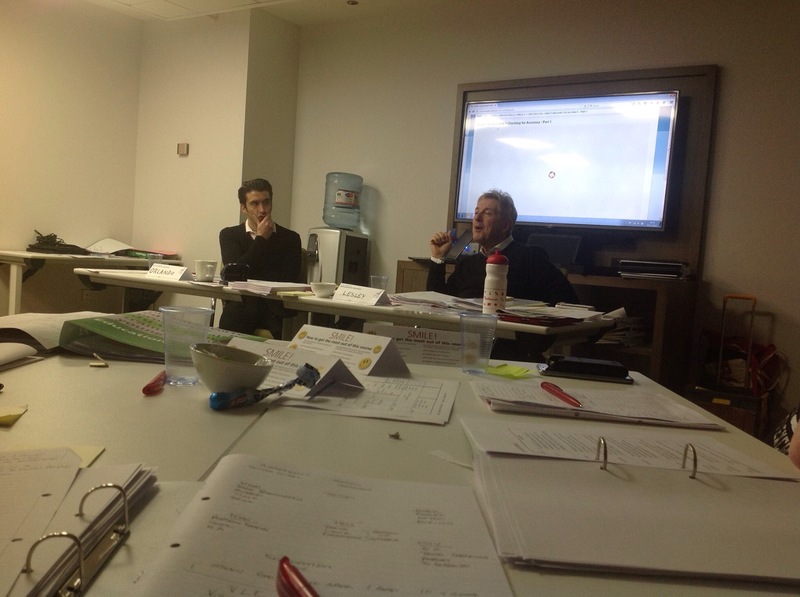 Barnsley Unite Community Centre Activist Brian Clarke has just finished a weeks training on the ESOL (English for speakers of other languages) facilitators Course in Eastbourne. See pictures attached, this will help with our ESOL classes every Wednesday which are still overstretched with demand! Thanks goes to Brian and all the other activists for there continued passion and efforts. United we bargain Divided we beg. “The Orgreave Truth and Justice Campaign seeking truth and justice for all miners victimised by the police at The Orgreave Coking Plant South Yorkshire, June 1984. Orgreave is part of the pattern of cover ups and lies by the police from the many different forces, which are now being exposed. We call for a public inquiry to take place as soon as possible into the policing and subsequent statements recorded by the police at the time. Inspired by the accounts of miners who lived through the strike, Undermined depicts a year where friendships were strengthened and communities came together. Experience the events through the eyes of young miner Dale, as he takes you through his personal story inviting you into the action. 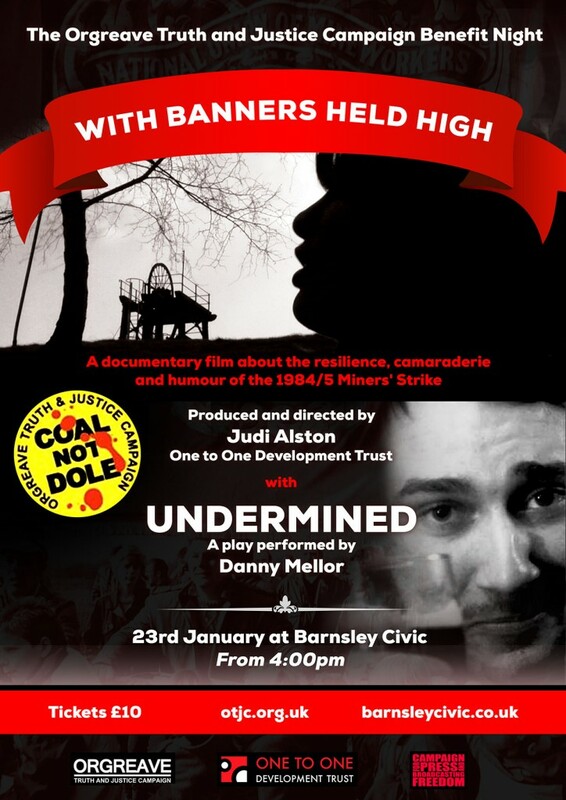 This oneman show explores the humour and struggles of the miners’ strike through energetic and gripping storytelling. Danny Mellor presents a youthful and contemporary approach to one of Britain’s most controversial disputes. This documentary explores the resilience of miners and Women Against Pit Closures through their sense of humour, camaraderie and community spirit in the 1984/5 miners’ strike. The ability to laugh and share funny moments or observations in times of adversity was important during the year-long strike. Their stories capture a legacy of contemporary history and offer a profound insight into the culture and heritage of the former coalfield communities. Judi Alston, of One to One Development Trust, directed the film, which was commissioned for the ‘With Banners Held High’ event held in Wakefield on Saturday 7 March 2015. This Saturday Unite, in conjunction with the GMB and Community the union, is hosting the ‘Save our Steel’ rally at Sheffield City Hall. It comes amid a growing crisis in the UK’s steel industry which has seen thousands of job losses announced in recent months. 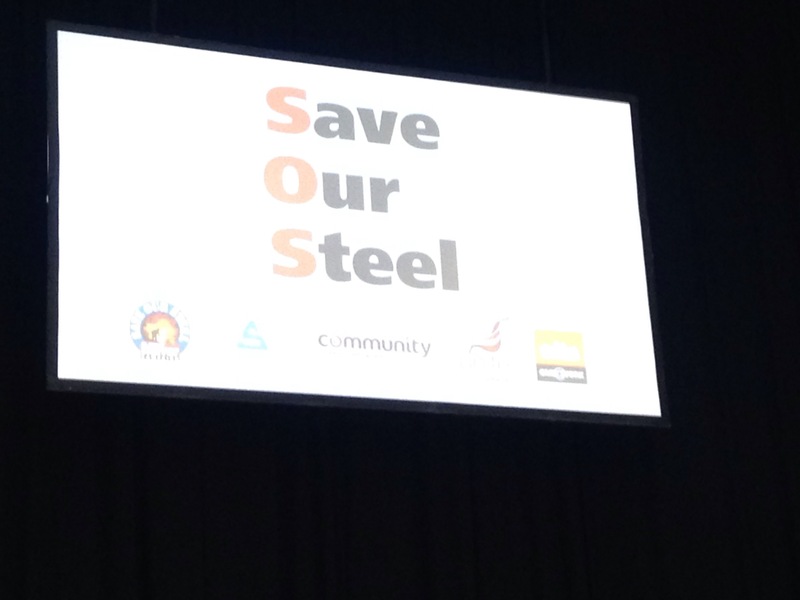 In addition to the closure of SSI in Redcar and the collapse of Caparo, Tata Steel plans to cut over 1,100 jobs in Scunthorpe and Scotland on top of 700 job losses it announced earlier in the year in Rotherham and South Yorkshire. Interest in the rally is building, but we need to use these remaining days to continue to promote it to our members, in their workplaces and communities. More information can be found here or by contacting campaigns and communications. 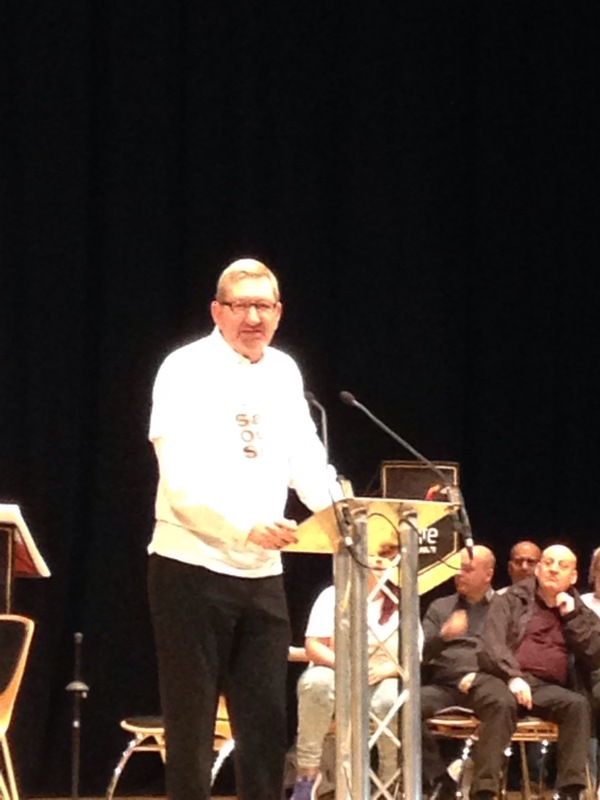 This is a time our members look to us for solidarity with their struggles and leadership in the battles ahead, please ensure that you do everything possible to make sure that Unite has strong representation at the rally and that where possible you and your colleagues make every effort to attend. Our members will expect to see us standing by their side. I hope to see you in Sheffield on November 21st. We won at Pizza Express! After Unite turned up the heat with a summer of campaigning the popular pizza chain announced (3 September 2015) that it would drop the 8% admin fee from tips left on a card. Giraffe, Ask, Zizzi, Byron Burger and most recently the Casual Dining Group, owners of Bella Italia, Belgo and Cafe Rouge have all said they too will scrap the fee and hand 100% of tips to staff. But with restaurants like Wahaca, and Jamie’s Italian under fire for deducting a percentage of sales from credit card tips, Prezzo and Strada still swiping a slice as an admin fee and Bill’s restaurant accused of pocketing a large proportion of the service charge, it is clear that we’ve still got some way to go in the fight for fair tips. Now we need the government to stamp out these rip off practices once and for all. We’ve set down an early day motion in parliament for MPs to get behind. You see the problem is that tips paid on a credit card and service charges are the property of the employer. As they own them they can do what they like with them. So until staff are given 100% ownership rights over their hard earned tips with complete control over how they are shared out, rogue employers will continue to cream off staff tips. Please tip in cash – leaving cash means the whole amount will go to the staff (divided between waiters and kitchen staff). Share your story – Fed up of your employer taking a slice of your hard-earned tips? Tell us about it. Visit the campaign page and view the Fair Tips film here. There will also be an opportunity to ask questions of our speakers. As numbers for this event are limited, please contact Caroline Hopwood at Caroline.Hopwood@unitetheunion.org or by telephone on 0113 322 3385 to reserve your place. Unite the union expresses its deepest sympathy and sends heartfelt condolences to the friends, families and loved ones of all those killed and injured in the horrific attacks that occurred in Paris. The perpetrators of the act and those behind it are guilty of a most barbaric act aimed at destabilising and dividing French society. They will not succeed. It is essential at this trying and difficult time that time that politicians and authorities are vigilant, but it is also essential that they do not reach for ill thought out solutions or slip into knee jerk reactions – that is precisely what those behind the act would want. We must not allow the tragedy to be used as a reason to turn our backs on the hundreds of thousands of refugees fleeing chaos, war and destruction, and we must act in unity against those who may seek to use the tragedy to sow further divisions, mistrust and hatred in society. Unity is strength. Unite will continue to stand in solidarity with the people of France.